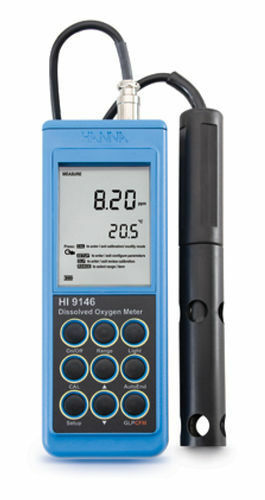 The HI9146 is a rugged, portable dissolved oxygen (DO) meter designed to provide laboratory precision and accuracy under harsh environmental and industrial conditions. This meter offers many features including automatic calibration, auto-endpoint detection, and compensation for temperature, salinity and altitude. The HI9146 is supplied complete with polarographic probe, PTFE membrane caps, electrolyte fill solution, and rugged carrying case.